This easy recipe makes a whole crockpot full of yummy BBQ meat that can be used for all kinds of dishes. 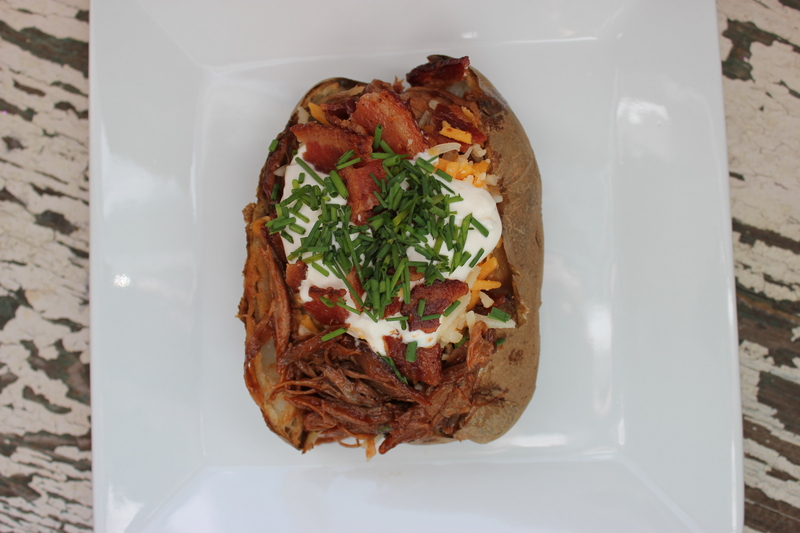 I LOVE stuffed baked potatoes and I load it with the bbq meat and lots of extra toppings!! One of these potatoes is a whole meal by itself! Great for taking to a picnic, Super Bowl party, or anytime you want. I used a spice rub recipe adapted from Cheryl and Bill Jamison’s cookbook called Smoke and Spice, but you can use your favorite bbq rub. This easy recipe makes a whole crockpot full of yummy BBQ meat that can be used for all kinds of dishes. I LOVE stuffed baked potatoes and I load it with the bbq meat and lots of extra toppings!! One of these potatoes is a whole meal by itself! Great for taking to a picnic, Super Bowl party, or anytime you want. I used a spice rub recipe adapted from Cheryl and Bill Jamison's cookbook called Smoke and Spice, but you can use your favorite bbq rub. Rub boar shoulder with dry rub, and wrap in saran wrap and refrigerate, overnight. Next day, turn on the crockpot to medium, remove the meat from the saran wrap, and add the boar shoulder to the crockpot. Chop bacon into 1 inch pieces, and fry in a large frying pan until crispy. Remove the bacon with a slotted spoon and reserve the ***bacon bits. Slice onions and jalapeños and add to the frying pan with the bacon grease and fry over medium heat until the onions and jalapeños are soft, about 10 minutes. Pour the onions and jalapeños over the boar shoulder, and add the beer. Cover the crockpot and cook for about 6+ hours, or until boar is tender. Shred the meat off the bone and add the meat back to the crockpot and discard the bones. Turn down the crockpot to low and place the shredded meat back to the crockpot. Add the BBQ sauce of your choice. Allow the boar to continue to cook, WITHOUT the lid for another 30-60 minutes. Poke holes in the potato, and rub all over with vegetable oil. Roll potatoes with salt and black pepper. Place the potatoes on the oven rack (unwrapped) and bake in a 425ºF oven for about 60 minutes. Slice open the potatoes and break apart some of potato and top with shredded boar meat, bacon bits, sour cream, cheese, and onions.